Jason Norris and Zachary Connerty met in 2001 while stationed at Fort Jackson, South Carolina. Zach was shift supervisor for a military police unit and Jason was newly assigned on base. Jason was to shadow Zach in order to learn the ropes on Fort Jackson but instead, he asked that he be provided a patrol car so he could figure things out on his own and “stay out of the way.” The two have been best friends ever since. More than two decades, six continents and a dozen duty stations between them, they will soon retire; however, they will always be soldiers bonded by experience and friendship. Experiencing the toll on the mind and body of deployments and military service, Jason and Zach went through a wounded soldier programs together. The events this program had to offer took the service men and women outdoors, outside of the typical therapies offered by the military. Soon after Zach and Jason joined this program, however, it was discontinued. The friends decided to have a guys’ weekend and drive to the World Deer Expo in Birmingham, Alabama. After talking to outfitters, business owners, and people who knew of the previous program, Zach and Jason began to realize that there was a void that needed to be filled- a void that they could fill. “Jason and I have always had a love for the outdoors and always talked about the possibility of doing business together one day. As the discussion and questions kept pointing to the idea of it happening now, we both looked at each other and finally just said, ‘why not us?’ We knew what that outreach program did for us and we now have the opportunity to provide that continued service to other veterans and wounded warriors,” said Zach. The ideas were born and would soon evolve into the nonprofit organization, BUC-OPS (Bonded Under Combat Outreach Programs). The premise of the program is relatively simple: gather a group of service members to attend an outdoor activity (hunting, fishing, archery, camping, etc. ), and watch change and healing unfold naturally through a common bond and the therapy of the great outdoors. “For us, we already know what kind of person it takes to handle the situations we’ve been in, so it goes without saying that we understand each other. Talking is therapy in itself but throwing in outdoor activities adds a sense of comfort that you can go out there and be yourself, escape the island so many of us put ourselves on,” says Jason. Each event will also include volunteers, possibly avid outdoorsmen and women, from fields such as Veteran Affairs, Veterans and Family Welfare and medical, financial and physical services. This will create an enduring mentoring relationship to connect the veteran with an individual they know and are comfortable talking to about different programs and issues. Then, when the hunting or fishing trip is over, that veteran has a name and a phone number to call when they have a need. The goal with this is to create a “continuous branch of connection” long after the trip is complete. The motto of BUC-OPS is “Rewind in the Blind.” In hunting, a blind is a structure in which hunters conceal themselves and hide from animals. BUC-OPS will partner with companies and individuals who offer a variety of outdoor activities, as well as private landowners and ranchers. This will allow for donated time, land and resources for various trips that veterans and wounded warriors in the program can apply to attend, free of charge. The non-profit organization allows qualified veterans of all wars, branches and both men and women to attend trips with people and activities that complement their personality and background. The only requirements to be included in the program is that the service member or veteran must have served in an approved conflict or combat operation and be considered or have obtained no less than a 30% disability rating or status. Applicants are vetted for service records then submitted to the BUC-OPS Board of Advisors, a group of volunteer, bipartisan business owners, industry leaders and various supporters of the organization. Trips could be for an afternoon or over the span of a few nights. While the activities for each trip vary, the idea of opening the lines of communication with other service members and veterans, as well as volunteers and industry specialists, remains the cornerstone of the mission of BUC-OPS. “We’ve found that veterans generally are not going to do a Google search for ‘mental health professional’ when they are in need. They take for granted the things that are available as an active duty service member on base but once you retire or depart the military, things aren’t as simple as walking across post for a certain program or specialist. We want to make it an easier transition and build those mentorship relationships, especially between older and younger veterans,” said Jason. 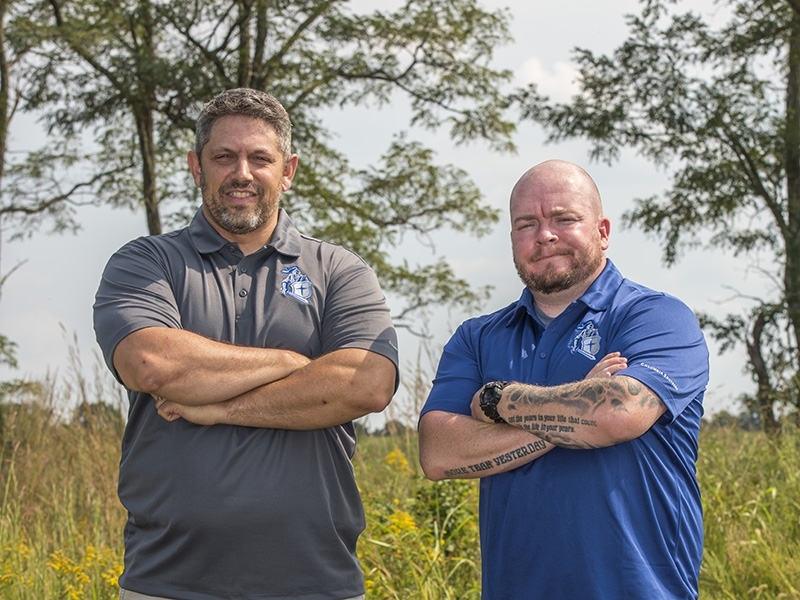 While there are extremely helpful and diverse resources for veterans available, BUC-OPS hopes to set themselves apart by creating a network of solid, continuous relationships between veterans, their peers and various professional contacts. “What we want to create is a network where we can bring other services and agencies to the veteran and provide a continuing service during our trips, allow clinicians and specialists to brief our veterans or even just introduce themselves, and then link them to the service member when we get home. We want to partner with other nonprofits to expand our network instead of compete with one another,” said Zach. They are hopeful that by “rewinding in the blind,” service members and veterans will feel safe and relaxed, maybe learn a new skill or hobby, while being pointed in the right direction in order to make their life better for what they sacrificed during service to our country. “The event, whether hunting, fishing, shooting, whatever it is, is the honey to draw folks in, what entices veterans to get off the couch, away from the bottle, off their island or whatever is making them sedentary and isolated. Doing things outdoors with people who have walked in your shoes makes you feel so much more alive,” said Jason. In the organization’s infancy, they will be operating in and around their home base of Clarksville, Tennessee, and expanding to Central Michigan, Florida, North Carolina, and Texas. All travel and expenses incurred are paid for by Jason and Zach. Their goal is to be able to hold ten events across the nation by next year. Within two years, they hope to have a company vehicle and a full-time office in which to operate. They are looking forward to hosting all-women trips, trips for family members of wounded veterans, get-togethers for program alumni and events to give back to those who have supported their mission. They would like to create a legacy within their families and military community to operate and grow BUC-OPS for years to come. “Our mission is the most important thing for us. Helping service members and veterans just like us heal from the visible and invisible wounds of the military, and doing it outdoors, is a way for us to give back,” says Zach.